Zombie Blackhawk bandwagon fans attack you in the Alpha of our new game. 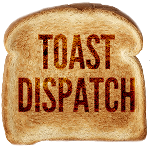 Toast Dispatch is excited to release the Alpha version of our new video game: Blackhawk Down! Blackhawk Down is a 1st person shooter where you must defend St. Louis landmarks from an invasion of Chicago Blackhawks zombie bandwagon fans. You must kill the zombies in waves with your gun and can pickup grenades you can lob into the hordes of bandwagon fans. The game is in a very early stage and feedback is appreciated! Help us decide where to go with this game! What would you like to see? A new map / location? Feature ideas? Weapons? New enemies? 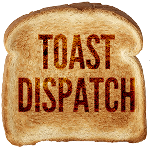 Let us know on Twitter (@ToastDispatch)! Right now the game can only be played on computers through your browser, but if there is enough interest we could look into porting it to Android / iOS. This game is being made by outsourced Chinese child labor, which is cheap and effective. our friends at bobmania.com, Ben is a 14yr old learning to program, so he is cheap and effective, and being a younger brother, flies under the radar of those pesky child labor laws. Shooting: Right click, hold longer for a more powerful shot. Grenades: Pick up a blue grenade power up, then right click to lob.